Eolian landforms are found in regions of the Earth where erosion and deposition by wind are the dominant geomorphic forces shaping the face of the landscape. Regions influenced by wind include most of the dry climates of the Earth (Figure 10ah-1). According to the Köppen Climate Classification System (see topic 7v), this would include regions of the world that are classified as arid deserts (BW) and semiarid steppe (BS). Wind can also cause erosion and deposition in environments where sediments have been recently deposited or disturbed. Such environments include lake and ocean coastline beaches, alluvial fans, and farmland where topsoil has been disturbed by cultivation. Figure 10ah-1: Global distribution of major deposits of eolian derived sediments. Unlike streams, wind has the ability to transport sediment up-slope as well as down-slope. The relative ability of wind to erode materials is is slight when compared to the other major erosional mediums, water and ice. Ice and water can have greater erosive power primarily because of their greater density. Water is about 800 times more dense than air (density of air is 1.29 kg m-3, while the density of water is 1000 kg m-3). This physical difference limits the size of particles wind can move. The power of wind to erode surface particles is controlled primarily by two factors: wind velocity and surface roughness. Erosive force increases exponentially with increases in wind velocity. For example, a velocity increase from 2 to 4 meters per second causes an eight-fold increase in erosive capacity, while an increase in wind speed from 2 to 10 meters per second generates a 125-fold increase in erosional force. Consequently, fast winds are capable of causing much more erosion than slow winds. At ground level, the roughness of the surface plays an important role in controlling the nature of wind erosion. Boulders, trees, buildings, shrubs, and even small plants like grass and herbs can increase the frictional roughness of the surface and reduce wind velocity. Vegetation can also reduce the erosional effects of wind by binding soil particles to roots. Thus, as a general rule, the areas that show considerable amounts of wind erosion are open locations with little or no plant cover. Threshold velocity can be defined as velocity required to entrain a particle of a particlular size. In general, the larger the particle, the higher the threshold velocity required to move it. This law can sometimes be broken when clay sized particles are involved in the entraiment process. Clay particles have a general tendency to become cohesively bonded to each other. This aggregation results in the clumping of several particles into a mass of much larger size. As a result, the threshold velocity required to entrain clay is as great as the wind speed required to move grains of sand. Silt is usually the easiest type of particle to be entrain by wind. Terminal fall velocity can be defined as velocity at which a particle being transported by wind or water falls out and is deposited on the ground surface. Figure 10ah-2 describes the terminal fall velocities for clay, silt, and sand sized particles for wind. On this semi-log graph, a simple, some what linear, relationship is observed. The larger the particle the greater the wind speed that is required to keep it moving above the ground surface. Figure 10ah-2: Falling velocities for clay, silt, and sand sized particles for wind. Note the fall velocity for clay is many orders of magnitude less than the fall velocity for sand. Most of our present knowledge about the wind's ability to erode and transportation sand comes from the 1920s to 40s work of Ralph Bagnold in the deserts of North Africa. In his numerous observations and experiments dealing with sand movement, Bagnold discovered many of the key principles controlling the erosion and transport of sand in deserts. Three different processes are responsible for the transport of sediment by wind. Wind erosion of surface particles begins when air velocities reach about 4.5 meters per second. A rolling motion called traction or creep (the later term should not to be confused with soil creep) characterizes this first movement of particles. In strong winds, particles as large as small pebbles can move through traction. About 20 to 25 percent of wind erosion is by traction. The second type of wind sediment transport involves particles being lifted off the ground, becoming suspended in the air, and then returning to the ground surface several centimeters downwind. This type of transport is called saltation, and this process accounts for 75 to 80 percent of the sediment transport in dry land environments. Saltating particles are also responsible for sending additional sediment into transport. When a falling particle strikes the ground surface, part of its force of impact is transferred to another particle causing it to become airborne. Small sized particles like silt and clay have the ability to be lifted well above the zone of saltation during very strong winds and can be carried in suspension thousands of meters into the air and hundreds of kilometers downwind. When the force of wind is concentrated on a particular spot in the landscape, erosion can carve out a pit known as a deflation hollow. Deflation hollows range in size from a few meters to a hundred meters in diameter, and may develop over several days or a couple of seasons. Much larger depressions are also found in the arid regions throughout the world. These broad, shallow depressions, called pans, can cover thousands of square kilometers. One of the largest pans, known as the Qattara Depression is found in the Lybian Desert of Egypt. This pan covers around 15,000 square kilometers. In some dry climate areas, persistent winds erode all sediments the size of sand and smaller leaving pebbles and larger particles on the ground surface. Surfaces loaded with such particles are called desert pavement or reg and sometimes resemble a worn, polished cobblestone street surface. Sand dunes are the most noticeable landforms produced by wind erosion and deposition of sediment. The largest dune fields are found in the Middle East and North Africa. Most large dune fields act more or less as closed systems. Once sand enters these systems, it does not leave. However, dune fields do shift across the Earth's surface from time to time. Periodic migrations of dune fields are normally caused by seasonal changes in wind direction. Over longer periods of time, dune fields may expand or contract because of climatic change. In the last few decades scientists have noticed a spatial expansion of deserts that may be correlated to human disturbance of natural vegetation cover because of agriculture. Sand dunes form in environments that favor the deposition of sand (Figure 10ah-3). Deposition occurs in areas where a pocket of slower moving air forms next to much faster moving air. Such pockets typically form behind obstacles like the leeward sides of slopes. As the fast air slides over the calm zone, saltating grains fall out of the air stream and accumulate on the ground surface. Figure 10ah-3: Wind ripples on top of much larger sand dunes. 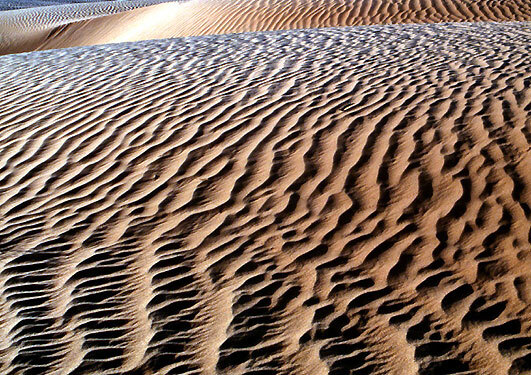 Wind ripples are mini-dunes between 5 centimeters and 2 meters apart and 0.1 to 5 centimeters in height. They are created by saltation when the sand grains are of similar size and wind speed is consistent. A series of wind ripples is initiate by a single irregularity in the ground surface. This irregularity launches the grains in the air and the consistences of size and windspeed cause saltation at repeated regular intervals downwind. Dunes first begin their life as a stationary pile of sand that forms behind some type of vertical obstacle. However, when they reach a certain size threshold continued growth may also be associated with active surface migration. In a migrating dune, grains of sand are transported by wind from the windward to the leeward side and begin accumulating just over the crest (Figure 10ah-4). When the upper leeward slope reaches an angle of about 30 to 34 degrees the accumulating pile becomes unstable, and small avalanches begin to occur, moving sand to the lower part of the leeward slope. As a result of this process, the dune migrates over the ground as sand is eroded from one side and deposited on the other. This process also causes the appearance of the dune to take on a wave shape. Active movement of sand particles across the dune causes windward slope to become shallow, while the leeward slope maintains a steep slope or slip-face. Figure 10ah-4: The following graphic animates the formation and movement of a sand dune. Sand dunes begin when a ground obstruction influences the areodynamic movement of wind and saltating sand particles. As the wind blows over the obstruction, velocity is reduced causing particles to fall out of the air stream. The pile of particles builds both vertically and horizontally, and the dune is at first stationary. The dune continues to grow vertically, and at a certain height the top of the feature begins to encounter faster moving air. This causes particles to be lifted from the windward side of dune. As these lifted particles move forward they reach areas of slower wind speeds at the leeward end of the dune, causing the particles to fall out of the air. The net result of this process is the migration of sand particles from the front of the dune to its backside. It also causes the whole dune to move forward. (To view this animation your browser must have Apple's QuickTime plug-in. The QuickTime plug-in is available for Macintosh and Windows operating system computers and can be downloaded FREE from the World Wide Web site www.apple.com/quicktime). The velocity of the wind above the ground surface determines the height of a dune. The maximum height is variable but usually falls in the range of 10 to 25 meters. In most cases, dune height is a function of surface friction. Height growth stops when friction can no longer slow the wind flowing over the dune to a point where deposition occurs. The tallest sand dunes in the world are found in Saudi Arabia and measure more than 200 meters. However, these features are not individual dunes, but a massive complex of sand dunes that forms when smaller, faster moving dunes migrate onto larger, slower moving dunes. Desert sand dunes occur in an amazing diversity of forms. Table 10ah-1describes the major types of dunes classified by geomorphologists. Table 10ah-1: Major types of sand dunes. Barchan Crescent-shaped dune whose long axis is transverse to the dominant wind direction. The points of the dune, called the wings of the barchan, are curved downwind and partially enclosing the slip-face. Barchans usually form where there is a limited supply of sand, reasonably flat ground, and a fairly even flow of wind from one direction. Single slipface. Transverse Long asymmetrical dunes that form at right angles to the wind direction. Form when there is an abundant supply of sand and relatively weak winds. These dunes have a single long slip-face. Parabolic Crescent-shaped dune whose long axis is transverse to the dominant wind direction. The points of this dune curve upwind. Multiple slip-faces. These dunes form when scattered vegetation stabilizes sediments and a U-shaped blowout forms between clumps of plants. Barchanoid Ridge Is a long, asymmetrical dune that runs at right angles to the prevailing wind direction. A barchanoid ridge consists of several joined barchan dunes and looks like a row of connected crescents. Each of the barchan dunes produces a wave in the barchanoid ridge. Occurs when sand supply is greater than in the conditions that create a barchan dune. Longitudinal Sinuous dune that can be more than 100 kilometers long and 100 meters high. Created when there are strong winds from at least two directions. The dune ridge is symetrical, aligned parallel to the net direction of the wind, and has slipfaces on either side. See Figure 4r-5 below. Seif Sub-type of longitudinal dune that is shorter and has a more sinuous ridge. Star Dune Large pyramidal or star-shaped dune with three or more sinuous radiating ridges from a central peak of sand. This dune has 3 or more slipfaces. Produced by variable winds. This dune does not migrate along the ground, but does grow vertically. Dome Mound of sand that is circular or elliptical in shape. Has no slip-faces. May be formed by the modification of stationary barchans. Reversing Dune that is intermediate between a star and transverse dunes. Ridge is asymmetrical and has two slip-faces. Figure 10ah-5: Longitudinal dunes, Arabian Peninsula (Source: NASA). Active sand dune formation is also found on the coasts of the continents. Coastal dunes form when there is a large supply of beach sand and strong winds blowing from sea to shore (Figure 10ah-5). The beach area must also be wide and sufficiently influenced by wave action to keep it free of plants. Many coastal dune deposits develop in association with blowouts in ridges of beach sand. Blowouts are small saucer shaped depressions where there is a deposit of sand at the upwind end of the feature. As wind erosion continues, the deposit grows and begins to migrate inland forming a parabolic sand dune. 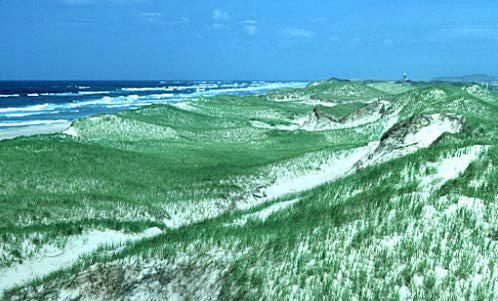 The flanks of these dunes tend to be more stable and are often colonized by plants like dune grass, sea oats, and sand cherry. This colonization by plants re-inforces the stability of the dune's flanks. Coastal dunes are dissimilar from desert dunes in their form and shape and the fact that they do not migrate. The presence of vegetation limits migration and radically modifies the dune environment by altering the patterns of airflow, reducing sand erosion, and stabilizing the leeslope of the dune. Figure 10ah-5: Vegetated beach dune. (Source: Natural Resources Canada - Terrain Sciences Division - Canadian Landscapes). Loess is another major deposit created by wind. Less visible than sand dunes, loess is found over large areas of the Earth (Figure 10ah-6). It is also important for humans because it creates very fertile soils. Large deposits of loess exist in northeastern China, central plains of the United States, Pampas of Argentina, the Ukraine, and central Europe. Loess is mainly composed of silt. Because of its small size it can be held in suspension and carried great distances by wind. Most loess deposits appear to have been formed by winds that blew over glacial deposits during the Pleistocene. The major deserts of the world also appear to have produced significant amounts of loess. Recent research has uncovered that soils in the Amazon basin may have been enriched with loess deposits that originated from African deserts. Figure 10ah-6: Global distribution of major deposits of loess sediments.